Joseph Woodward Jr. was born between 1713 and 1716 at Chester, Pennslyvania. He was the son of Joseph Woodward and Elizabeth Mercer. Joseph Woodward Jr. married Rachel Woodward, daughter of Thomas Woodward and Rachel Martin, in 1735 Joseph Woodward, Jr married, in 1735, his first cousin Rachel Woodward, daughter of Thomas & Rachel Martin Woodward. They evidently made their amends with the Quakers as they were granted a certificate to Kennett Monthly meeting 7/5/1747. Rachel Woodward was the daughter of Thomas Woodward and Rachel Martin. Rachel Woodward married Joseph Woodward Jr., son of Joseph Woodward and Elizabeth Mercer, in 1735 Joseph Woodward, Jr married, in 1735, his first cousin Rachel Woodward, daughter of Thomas & Rachel Martin Woodward. They evidently made their amends with the Quakers as they were granted a certificate to Kennett Monthly meeting 7/5/1747. Thomas Woodward was the son of Richard Woodward and Jane (?). 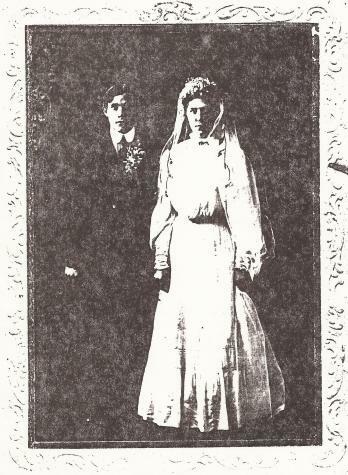 Thomas Woodward married Rachel Martin. Married Name Her married name was Woodward. Rachel Martin married Thomas Woodward, son of Richard Woodward and Jane (?). Name Variation Rudolf H. Hinrichs was also known as Henrich. Name Variation Rudolf H. Hinrichs was also known as Hinrich. Name Variation Rudolf H. Hinrichs was also known as Henrichs. Name Variation Rudolf H. Hinrichs was also known as Rudolph. Rudolf H. Hinrichs was born in 1885 at Illinois. He was the son of (?) Hinrichs and Mary (?). Rudolf H. Hinrichs was buried in 1940 at Peotone Cemetery, Peotone, Will, Illinois. Rudolf H. Hinrichs was a cabinet maker on 15 January 1920. [S192] St. John's Ev. Lutheran, St. John's Churchbook Extract, No. 102 Pg. 263 No. 6. [S244] U.S. Federal Census 1910 U.S. Federal Census, by Ancestry.com, ED191. Dwelling 284. [S243] U.S. Federal Census 1920 U.S. Federal Census, by Ancestry.com, ED199. Dwelling 203. [S250] U.S. Federal Census 1930 U.S. Federal Census, by Ancestry.com, ED99-75. Dwelling 10. Name Variation Heinrich Johann Stolzenbach was also known as Spalzenbach. Nickname Heinrich Johann Stolzenbach also went by the name of Henry. Heinrich Johann Stolzenbach was born on 1 June 1882 at Illinois. Heinrich Johann Stolzenbach died on 26 January 1950 at Grant Park, Kankakee, Illinois, at age 67. [S192] St. John's Ev. Lutheran, St. John's Churchbook Extract, No. 103 Page. 264 No. 2. [S243] U.S. Federal Census 1920 U.S. Federal Census, by Ancestry.com, ED207. Sheet 8B. Dwelling 169. [S250] U.S. Federal Census 1930 U.S. Federal Census, by Ancestry.com, ED99-84. Dwelling 113. [S324] Illinois Will and Southern Cook County 1918 Prairie Farmer's Directory, by Illinois Will and Southern Cook County. Name Variation Katherine Maria Louisa Anna Magdalena Frahm was also known as Maria Louise. She was the daughter of Jacob Frahm Jr. and Margaretha Catharina Dorothea Fedde. [S192] St. John's Ev. Lutheran, St. John's Churchbook Extract, Pg. 98 No. 15. [S192] St. John's Ev. Lutheran, St. John's Churchbook Extract, Death pg 276. No 159. Name Variation Emma Wilhelmine Klemme was also known as Minnie E.
Nickname Emma Wilhelmine Klemme also went by the name of Minna. Married Name 22 November 1899 As of 22 November 1899,her married name was Heising. Emma Wilhelmine Klemme married Fred Heising, son of Friedrich Wilhelm Heising and Mary (? ), on 22 November 1899 at Chicago Heights, Cook, Illinois. 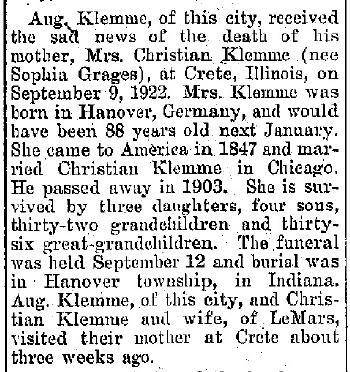 Emma Wilhelmine Klemme died on 16 February 1954 at Chicago Heights, Cook, Illinois, at age 76. [S193] Church Record, Zion United Lake Co IN Extract, Baptism pg 443. no 54. [S192] St. John's Ev. Lutheran, St. John's Churchbook Extract, Confirmation pg 150. [S246] U.S. Federal Census 1880 U.S. Federal Census, by Ancestry.com, ED 214. Dwelling 3. Pg 2. [S245] U.S. Federal Census 1900 U.S. Federal Census, by Ancestry.com, ED1139. Dwelling 332. [S243] U.S. Federal Census 1920 U.S. Federal Census, by Ancestry.com, ED13. Dwelling 125. [S250] U.S. Federal Census 1930 U.S. Federal Census, by Ancestry.com, ED16-2016. Dwelling 14. [S373] U.S. Federal Census 1940 U.S. Federal Census, by Ancestry.com, Year: 1940; Census Place: Chicago Heights, Cook, Illinois; Roll: T627_774; Page: 1B; Enumeration District: 16-59. Name Variation Carl Klemme was also known as Charles Klemme. Name Variation Carl Klemme was also known as Karl. Carl Klemme died on 28 May 1937 at Chicago, Cook, Illinois, at age 61. He was buried on 30 May 1937 at Evergreen Hill Cemetery, Steger, Will, Illinois. [S192] St. John's Ev. Lutheran, St. John's Churchbook Extract, confirmation pg 151. [S193] Church Record, Zion United Lake Co IN Extract, Baptism pg 413. no 50. [S332] Indiana Marriage Records, by Indiana, Book: L Original Source Page: 63. Name Variation Maria Alwine Elisabeth Klemme was also known as Alvina Lenore. Maria Alwine Elisabeth Klemme married Friedrich Wilhelm Heinrich Albert Karl Klemme, son of Heinrich Christian Klemme Jr. and Maria Dorothea Sophia Grages, after 1889. 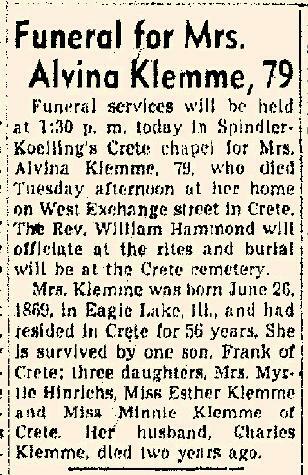 She was buried on 5 November 1948 at Crete Cemetery, Crete, Will, Illinois. June 1900 Crete, Will, Illinois Maria Alwine Elisabeth Klemme was listed as wife in Friedrich Wilhelm Heinrich Albert Karl Klemme's household on the 1900 Census at Crete, Will, Illinois. Maria Alwine Elisabeth Klemme lived with Friedrich Wilhelm Heinrich Albert Karl Klemme in 1918 at Crete, Will, Illinois.7 In March 1923 Mrs Carrie Behlke of East Chicago spent Sunday at the Charles A. Klemme home. [S192] St. John's Ev. Lutheran, St. John's Churchbook Extract, Confirmation pg 143. [S193] Church Record, Zion United Lake Co IN Extract, Baptism pg 289. no 35. [S238] Illinois Death Records, by Illinois, certificate 0046970. [S243] U.S. Federal Census 1920 U.S. Federal Census, by Ancestry.com, ED145. Dwelling 52. [S250] U.S. Federal Census 1930 U.S. Federal Census, by Ancestry.com, ED99-2. Dwelling 97. Name Variation Johan Elmer Friedrich Frahm was also known as Elmer. [S192] St. John's Ev. Lutheran, St. John's Churchbook Extract, Death pg 295. [S192] St. John's Ev. Lutheran, St. John's Churchbook Extract, Baptism pg 106. [S192] St. John's Ev. Lutheran, St. John's Churchbook Extract, Baptisms pg 106. [S194] Beecher Will Co IL, Burials. 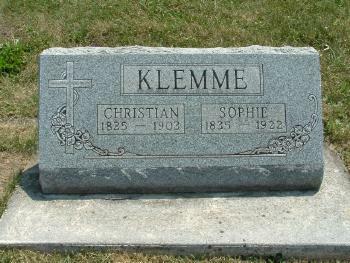 Name Variation Daughter Klemme was also known as Tochter German for daughter. Daughter Klemme was born on 6 February 1726 at Sabbenhausen, Lippe, Germany. She was the daughter of Simon Heinrich Brenecker and Trin Elizabeth Klemme. Daughter Klemme died in 1742 at Sabbenhausen, Lippe, Germany. Name Variation Johann Friederich Christoph Brenker was also known as Friedrich. Johann Friederich Christoph Brenker was born in 1777 at Ratsiek, Schwalenberg, Germany. He was the son of Friederich Adolph Brenker and Sophia Elisabeth Charlotta Waldhoff. Johann Friederich Christoph Brenker was baptized on 20 April 1777 at Evangelisch, Falkenhagen, Lippe, Germany. He married Elisabeth Richtsmeyer on 9 October 1798 at Evangelisch, Falkenhagen, Sabbenhausen, Lippe Detmold, Germany, also reported as 23 Oct 1793. Johann Friederich Christoph Brenker witnessed the baptism of Anna Marie Elizabeth Brenker on 21 February 1802 at Evangelisch, Falkenhagen, Lippe, Germany. Name Variation Elisabeth Richtsmeyer was also known as Richts. Name Variation Elisabeth Richtsmeyer was also known as Elizabeth Richmeyer. Married Name 9 October 1798 As of 9 October 1798,her married name was Brenker. Elisabeth Richtsmeyer was born at Sabbenhause, Lippe Detmold, Germany. She married Johann Friederich Christoph Brenker, son of Friederich Adolph Brenker and Sophia Elisabeth Charlotta Waldhoff, on 9 October 1798 at Evangelisch, Falkenhagen, Sabbenhausen, Lippe Detmold, Germany, also reported as 23 Oct 1793. Elisabeth Richtsmeyer witnessed the baptism of Anna Marie Elizabeth Brenker on 21 February 1802 at Evangelisch, Falkenhagen, Lippe, Germany. Married Name 2 October 1781 As of 2 October 1781,her married name was Zumdahl. Anna Maria Dorthea Elisabeth Klemme was born on 28 December 1755 at Sabbenhausen, Lippe Detmold, Germany. She was the daughter of Johann Herman Klemme and Anna Lucia Elizabeth Dreyes. Anna Maria Dorthea Elisabeth Klemme married Johann Conrad Zumdahl on 2 October 1781 at Falkenhagen, Schwalenburg, Germany. Anna Maria Dorthea Elisabeth Klemme died on 7 March 1811 at Sabbenhausen, Lippe Detmold, Germany, at age 55. Johann Conrad Zumdahl married Anna Maria Dorthea Elisabeth Klemme, daughter of Johann Herman Klemme and Anna Lucia Elizabeth Dreyes, on 2 October 1781 at Falkenhagen, Schwalenburg, Germany. Anna Dorthea Elizabeth Klemme died on 26 October 1758 at Sabbenhausen, Lippe Detmold, Germany. She was born on 26 October 1758 at Sabbenhausen, Lippe Detmold, Germany. [S404] Germany Baptisms and Baptisms Digital Archives, by Ancestry.com, FHL Film Number: 809903. He was born on 12 September 1759 at Sabbenhausen, Lippe Detmold, Germany. He was the son of Johann Herman Klemme and Anna Lucia Elizabeth Dreyes. Johann Christoph Klemme died on 23 April 1769 at Sabbenhausen, Lippe Detmold, Germany, at age 9. Married Name 22 May 1788 As of 22 May 1788,her married name was Brenker. Anna Justina Klemme was born on 5 February 1765 at Sabbenhausen, Lippe Detmold, Germany. [S405] Germany Marriages Digital Archives, by Ancestry.com, FHL Film Number: 809903. Dorothea Elisabeth Klemme was born in February 1770 at Sabbenhausen, Lippe Detmold, Germany. She died in 1770 at Sabbenhausen, Lippe Detmold, Germany. Friedrich Karl Heinrich Klemme was born on 12 February 1796 at Sabbenhausen, Lippe Detmold, Germany. He was the son of Johann Christian Klemme and Sophia Christine M. Herbst. Friedrich Karl Heinrich Klemme was baptized on 14 February 1796 at Evangelisch, Falkenhagen, Lippe, Germany. He died on 19 November 1799 at Sabbenhausen, Lippe Detmold, Germany, at age 3. Name Variation Heinrich Carl Klemme was also known as Johann Karl. Name Variation Heinrich Carl Klemme was also known as Heinrich Karl. Heinrich Carl Klemme was born on 3 June 1799 at Sabbenhausen, Lippe Detmold, Germany. Anna Maria Wilhelmine Klemme was born on 3 February 1804 at Sabbenhausen, Lippe Detmold, Germany. She was the daughter of Johann Christian Klemme and Sophia Christine M. Herbst. She died in 1804 at Sabbenhausen, Lippe Detmold, Germany. Baby boy Klemme died on 24 March 1805 at Sabbenhausen, Lippe Detmold, Germany, also reported as 26 Mar 1805. He was christened on 24 March 1805 at Evangelisch, Falkenhagen, Lippe, Germany. He was born on 24 March 1805 at Sabbenhausen, Lippe Detmold, Germany. Caroline Sophia Klemme was born on 23 March 1808 at Sabbenhausen, Lippe Detmold, Germany, also reported as 25 Mar 1808. Married Name 8 September 1901 As of 8 September 1901,her married name was Frahm. Clara Balgemann was born on 4 April 1876 at Illinois. She was the daughter of Henry Balgemann and Louise Bultman. 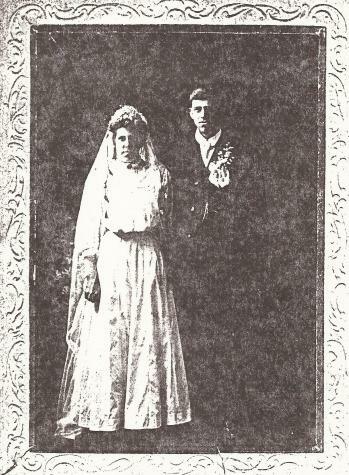 Clara Balgemann married Jacob Heinrich Frahm, son of Jacob Frahm Jr. and Margaretha Catharina Dorothea Fedde, on 8 September 1901. Clara Balgemann died on 17 February 1920 at age 43. [S246] U.S. Federal Census 1880 U.S. Federal Census, by Ancestry.com, NA Film Number T9-0219 Sheet 7B. [S244] U.S. Federal Census 1910 U.S. Federal Census, by Ancestry.com, Sheet 9B. ED198. Dwelling 170. [S243] U.S. Federal Census 1920 U.S. Federal Census, by Ancestry.com, ED207. Stamp 221. Dwelling 106. Sheet 6A. 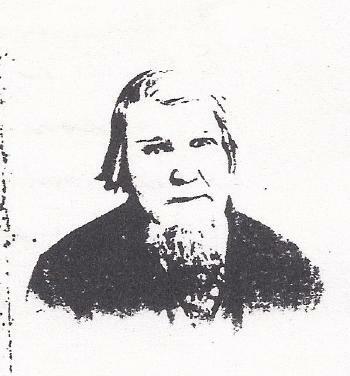 Henry Kane was born in 1822 at Ireland. He was the son of (?) Kane. Henry Kane married Mary McCollon before 1856. Henry Kane died on 18 January 1902. He was buried after 18 January 1902 at St. Margaret Catholic Cemetery, Kimball, Brule, South Dakota, Name: Kane, Henry b. 1822 d. 18 Jan 1902 age: 80y Section: A Block: 2 Lot: 24 Grave: 3. 1895 South Dakota State Census, Plainfield, Brule, South Dakota He and Mary McCollon appeared on the census of 1895 at South Dakota State Census, Plainfield, Brule, South Dakota. Henry Kane purchased land on 20 December 1884 at Brule, South Dakota, KANE HENRY, Meridian: 05 Twp: 103 N, Range: 068 W, section: 025, Acreage: 160, Type:272002, PATENT, Docid: 10468 Date: 12/20/1884. He purchased land on 14 October 1890 at Brule, South Dakota, Name: KANE HENRY Meridian: 05 Twp: 103 N Range: 067 W Section: 006 Type: 251101 PATENT, Document ID: 10129 Date: 10/14/1890 Acreage: 4 parcels (40, 39.89, 34.1, 34.37). [S245] U.S. Federal Census 1900 U.S. Federal Census, by Ancestry.com, ED65 Dwelling 112. Sheet 6B. Name Variation Joseph C. Kane was also known as Joe C.
Joseph C. Kane was born in February 1876 at Wisconsin. 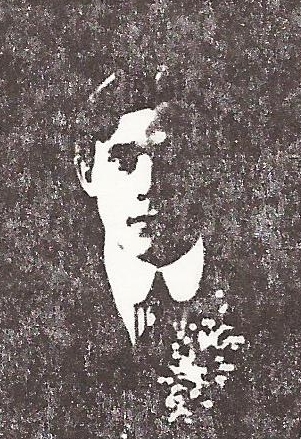 He was the son of Henry Kane and Mary McCollon. Joseph C. Kane married Margaret E. Honner, daughter of (?) Honner and unknown (? ), circa 1901. Joseph C. Kane died in 1942. He was buried in 1942 at St. Ann's Catholic Cemetery, near Geddes, Charles Mix, South Dakota, Block 34 Lot 2 Grave 6. 1895 South Dakota State Census, Plainfield, Brule, South Dakota Joseph C. Kane appeared on the census of 1895 in the household of Henry Kane and Mary McCollon at South Dakota State Census, Plainfield, Brule, South Dakota. [S244] U.S. Federal Census 1910 U.S. Federal Census, by Ancestry.com, ED90. Dwelling 90. [S243] U.S. Federal Census 1920 U.S. Federal Census, by Ancestry.com, ED40. Dwelling 8. [S250] U.S. Federal Census 1930 U.S. Federal Census, by Ancestry.com, ED12-8. Dwelling 4. [S253] Charles Mix SD Index to 1906 Atlas, by Charles Mix SD, Pg. 25. Name Variation Heinrich Christian Klemme Jr. was also known as Chris. Name Variation Heinrich Christian Klemme Jr. was also known as Christ. Name Variation Heinrich Christian Klemme Jr. was also known as Christian. He was the son of Heinrich Christian Klemme and Anna Marie Elizabeth Brenker. 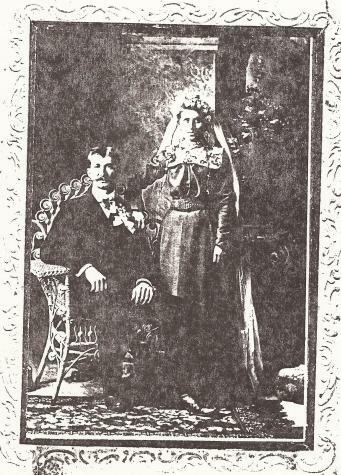 He married Maria Dorothea Sophia Grages, daughter of Johann Friedrich Conrad Grages and Catherina Dorothea Stock, in 1854 at Crete, Will, Illinois. 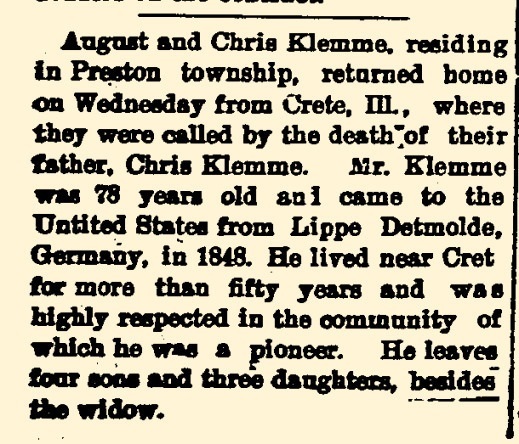 Heinrich Christian Klemme Jr. died on 23 February 1903 at Endo, Will, Illinois, at age 78 Christian Klemme, of Crete township, aged 78 years. He had lived in Eastern Will county for 50 years. ****** August and Chris Klemme. residing in Preston township, returned home on Wednesday from Crete, Illinois, where they were called by the death of their father, Chris Klemme. 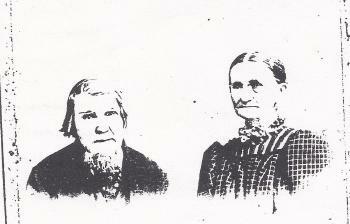 Mr. Klemme was 78 years old and came to the United States from Lippe Detmolde, Germany, in 1818. He lived near Crete for more than fifty years and was highly respected in the community of which he was a pioneer. He leaves four sons and three daughters, besides the widow. He was buried after 23 February 1903 at Zion United Church of Christ Cemetery, Dyer, Lake, Indiana. 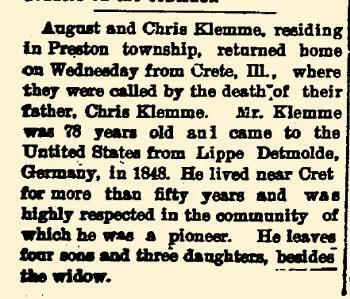 1862 Able Bodied Male Citizens, Crete, Will, Illinois Heinrich Christian Klemme Jr. appeared on the census of 1862 at Able Bodied Male Citizens, Crete, Will, Illinois, Number 104. Klemme, Christian, age: 38, Town: Crete, Nativity: Germany, Occupation: brick maker. Heinrich Christian Klemme Jr. immigrated with Heinrich Christian Klemme and Anna Marie Elizabeth Brenker on 11 July 1848 at New York; Heinrich Klemme came to America in 1848 with seven children. (Also reported as "The ship was Brig Reform. It left from Bremen, Germany on 5-9-1848 and arrived in New York on 6-28-1848. #330 Christian Klemme of Sabbenhausen house # 39 occupation farmer, with wife and seven children. Page S-135."). [S249] U.S. Federal Census 1850 U.S. Federal Census, by Ancestry.com, Dwelling 116. [S247] U.S. Federal Census 1870 U.S. Federal Census, by Ancestry.com, Dwelling 206. Page 32. [S246] U.S. Federal Census 1880 U.S. Federal Census, by Ancestry.com, ED190. Pg 28. Dwelling 263. [S245] U.S. Federal Census 1900 U.S. Federal Census, by Ancestry.com, Dwelling 248. ED101. [S193] Church Record, Zion United Lake Co IN Extract, Pg 56. Name Variation Maria Dorothea Sophia Grages was also known as Sophia Grages. Name Variation Maria Dorothea Sophia Grages was also known as Sophie. Married Name 1854 As of 1854,her married name was Klemme. Maria Dorothea Sophia Grages was born on 3 January 1835 at Bokeloh #5, Wunstorf, Neustadt, Hannover, Germany. She was the daughter of Johann Friedrich Conrad Grages and Catherina Dorothea Stock. Maria Dorothea Sophia Grages married Heinrich Christian Klemme Jr., son of Heinrich Christian Klemme and Anna Marie Elizabeth Brenker, in 1854 at Crete, Will, Illinois. Maria Dorothea Sophia Grages died on 9 September 1922 at Crete, Will, Illinois, at age 87 Aug. Klemme, of this city, received the sad news of the death of his mother, Mrs. Christian Klemme . 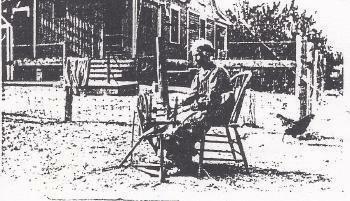 (nee Sophia Grages), at Crete, Illinois, on September 9, 1922. Mrs. Klemme was born in Hanover, Germany, and would have been 88 years old next January. 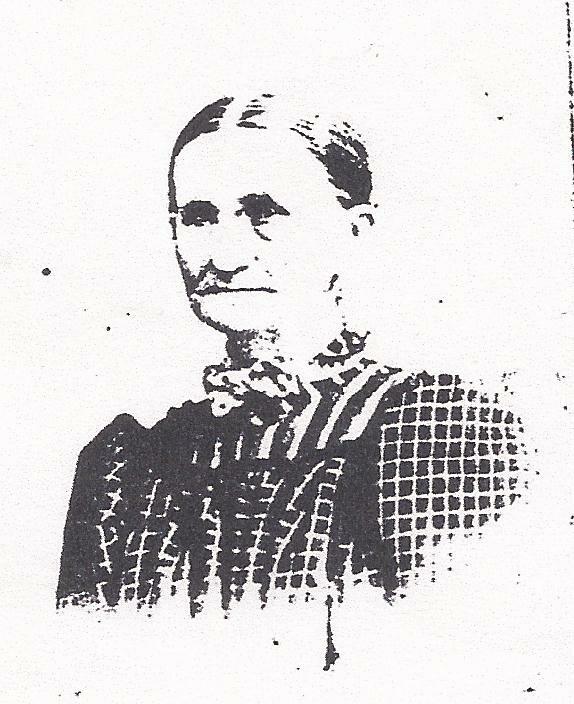 She came to America in 1847 and married Christian Klemme in Chicago. He passed away in 1903. She is survived by three daughters, four sons, thirty-two grandchildren and thirty-six great-grandchildren. The funeral was held September 12 and burial was in Hanover township, in Indiana. Aug. Klemme, of this city, and Christian Klemme and wife, of LeMars, visited their mother at Crete about three weeks ago. - Akron Register-Tribune, Akron, Plymouth, Iowa, USA Thursday, September 14, 1922. She was buried on 12 September 1922 at Zion United Church of Christ Cemetery, Dyer, Lake, Indiana, also reported as Zion Cemetery, Hanover, IN. Ship Name: Bastide. Maria Dorothea Sophia Grages had 8 with 7 living in 1900 children. In May 1907 at Bonfield, Kankakee, Illinois, Sophie Klemme visiting ill sister (Dorothy Freise) with daughter Emma Boehner. Children of Maria Dorothea Sophia Grages and Heinrich Christian Klemme Jr.
[S244] U.S. Federal Census 1910 U.S. Federal Census, by Ancestry.com, Sheet 4A. Stamp 17. ED143. Dwelling 46.